This blog is a place for students, parents, and friends to learn about what is going on in the Paradise Charter Middle School's garden. 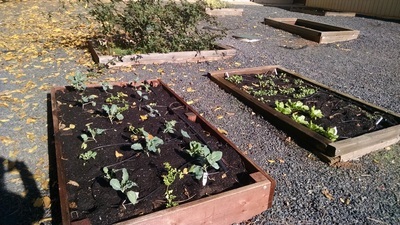 We have some big plans, so please check back as we upgrade our school's garden beds! First off, a big thank you goes out to the local non-profit, A Seat at the Table, which funded the purchase of some new garden tools for our school. We very much appreciate their support! At the beginning of October, the new sixth graders were introduced to the garden. Though there still were a few tomatoes left and the ground cherry was still going strong, it was time to put in some winter crops. The students sampled the ground cherries one last time then pulled the remaining plants out to make space for broccoli, cabbage and cauliflower starts. They worked the soil and planted seeds of sugar snap peas, carrot seeds, and white icicle radishes as well as onion sets brought by Mr. Whitney (who also brought more worm soil from the Earthworm Soil Factory for our beds-- thanks to both!). There was a large harvest of sweet basil and some students had never tasted pesto so I made some and offered it as a taste test to students the following day. The results were surprising. Of 48 who sampled the pesto and voted, 45 checked that they liked the pesto-- sweet basil was a definite hit among our students and staff. This is good news as basil is packed with good stuff for the body; it is high in vitamins K, A, and C as well as manganese, copper, iron, folate, calcium and magnesium. ​The following week some of the seventh graders came out to make their contribution to the winter garden. They planted celery, lettuce and a few more broccoli starts and more seeds-- kale, rainbow chard, beets, carrots and parsley. We reviewed some of what they learned about earth science in the 6th grade. We talked about where soil comes from and what it is composed of. We also tested soil for nitrogen levels and learned that we definitely need to add some nitrogen to the beds. Perhaps the next lesson should be how to make good compost to add nitrogen back to the soil. Lastly, the beds were covered over with bird netting to keep the local birds from sampling our seeds while we eagerly await a winter harvest. What Do Deer, 7th Graders, and the Aztecs Have in Common? They all liked tomatoes! Read on to find out more about how these seemingly unrelated groups are connected. At the end of last spring, the 6th graders had planted numerous tomato plants that they had started from seed in the garden. Over the summer, the plants had grown into a massive jungle of vines and green fruit into late July before some neighborhood ungulates (the fancy, scientific word for the group of hoofed mammals deer belong to) made several forays to the garden. First only nipping off the tender green tomato shoots, the hairy marauders soon decided to taste-test the large green fruits dangling temptingly over the edges of the beds. This garden coordinator was chagrined to find the largest most beautiful beefsteaks (bigger than my extended palm!) still green but lying on the ground with single bites taken from them. Fortunately, the deer were unable to penetrate to the interior of the tomato jungle and fruits finally began to ripen along with beans, basil, cucumbers, peppers and pineapple tomatillos (a.k.a. ground cherries) as the students returned to school in August. Several harvests of cucumbers were offered to students at lunch and a giveaway basket was put out at the end of one day so veggies could be taken home. So that the new 7th graders could taste the tomatoes they had raised from seeds, we planned to make fresh salsa with them over two days after the long Labor Day weekend. However, the deer decided to have a party for Labor Day with tomato plants as their main buffet! Luckily for us, both 7th grade classes still managed to find enough inside the vine jungle to make salsa. Each class personalized their salsa with the addition of special ingredients-- green beans for one class, and lemon cucumbers the other. One class even got decorative and added a garnish of calendula flowers and cucumber slices. By now you are probably wondering what the Aztecs, who lived in Central America during the 14th, 15th and 16th centuries, have to do with this story. I'm sure Mr. Faith and Mrs. Behlke know that you can learn history and geography from gardening, but I was very pleased to learn of this example. Did you know that tomatoes are tropical plants-- and that they probably originated in the Andes of Peru before spreading throughout South and Central America? The Aztecs were an agricultural society that used several different forms of farming including complex irrigation systems. They, as well as the Mayans, cultivated the tomato plant and were the first to make salsa from their tomato bounty. One might naturally assume that tomatoes came to the States via our southern neighbors, but that was apparently not the case. Tomatoes were taken back to Spain by the Spanish conquistadors in the 1500's and then Spaniards shared them with their Italian neighbors who soon began raising them and incorporating them into many dishes. However, early Americans were fearful of the tomato at first and thought they were poisonous like their cousin, deadly nightshade. It wasn't until Italian immigrants starting coming to the United States in the 1800s that the tomato really caught on here. My kids found it a little mind-boggling trying to imagine Italian food before the advent of tomato sauce. Please stay tuned for the next installment as the new 6th graders plant the fall/winter garden. In the meantime, if you order seeds from Renee's Garden online, and enter the coupon code FR881E at checkout, Rene's Garden will donate 25% of the order total to PCMS to help support our gardening efforts! They have some wonderful seed collections that make great gifts for gardeners. Spring was a busy time in the Bulldogs' garden. The snow and sugar snap peas seeds we planted earlier in the year grew and produced well, as did the tomato, pepper and herb seeds we received from Peaceful Valley Farm Supply. We were pleasantly surprised to find that ALL of the seeds the students planted germinated. Peaceful Valley seed packets say germination is guaranteed and they are not kidding! Most of our seeds were 5 years old and some were planted-- shall we say "not exactly according to instructions?" -- yet they still managed to sprout. On a very hot day in April, a bunch of the 6th, 7th and 8th graders who were taking study hall elected to harvest peas and celery to make a snack to share and to transplant the tomato and pepper seedlings into paper cups. The tomatoes continued to grow in a sunny window with supplemental light and we sold them to raise money for the garden at our first plant sale at the PCMS Open House on May 10. Students enjoyed making hand-colored signs for our sale in study hall. The sale was a success and we brought in enough money to offset the cost of the grow-light and a few other supplies. A big thank you goes out to the parent and student volunteers who helped install one of the new garden boxes on a Saturday in April. The 6th graders took over 10 varieties of heirloom tomatoes we raised for the sale and planted them in the new box. They also harvested peas one last time before they cleared that box and the other garden boxes to make room for some pepper and pineapple tomatillo seedlings. Bean and cucumber seeds were planted next to the old pea trellis. They also planted cantaloupe and watermelon seeds and are hopeful for a fruit salad when they return in the fall. The end of the gardening day was celebrated with a salad of lettuce, sugar snap peas, strawberries and Calendula petals followed by popsicles to cool off from the heat. next time we plant Peaceful Valley tomato seeds, we don't need to plant so many! kids will eat salad they grew-- even without salad dressing! Thanks to everyone who supported and contributed to the PCMS garden. This blog may continue over summer to show our progress and we plan to install more boxes when we gather again in the fall for another school year. In the meantime, we leave you with this snippet to ponder. At Shady Creek, the students learn the the song "Dirt Made My Lunch." While this is true, you can take it a step further and acknowledge the worm chefs who made the dirt that made your lunch. So next time you see a worm, thank him for the salad you are eating. February brought some good news-- our garden was selected to receive a grant from Whole Kids Foundation to complete our garden upgrade plans! Additionally, after several months of much-needed rain our garden was growing well, and after a week of warm sunny weather, some of the radishes and the Napa cabbage were starting to bolt. Our lettuce either did not survive the cold or the seeds were planted too deeply, but we had plenty of baby kale and Napa cabbage leaves plus broccoli, radishes and young celery. It was time to make a celebration salad! Our peas were also doing well and needed support. On a second gardening day during the week, a team of 6th grade boys rigged up a trellis for the pea bed under the direction of a helpful dad. And the students planted lettuce seeds and some Cosmic Purple carrot seeds (thank you, Thomas) in the room we created in the beds earlier in the week. They also planted many varieties of tomato seeds, peppers and some herbs in seed starting trays that have made their home in a sunny window of the staff room. This is our first experiment in raising seedlings indoors. As February draws to close, we find ourselves inspired and hopeful after our success and the contacts and resources that volunteer garden coordinators received when they attended the Saturday session of "A Garden In Every School" Symposium sponsored by Soilborn Farms. Stay tuned for future updates on our gardening progress as we implement our plans and learn about gardening! 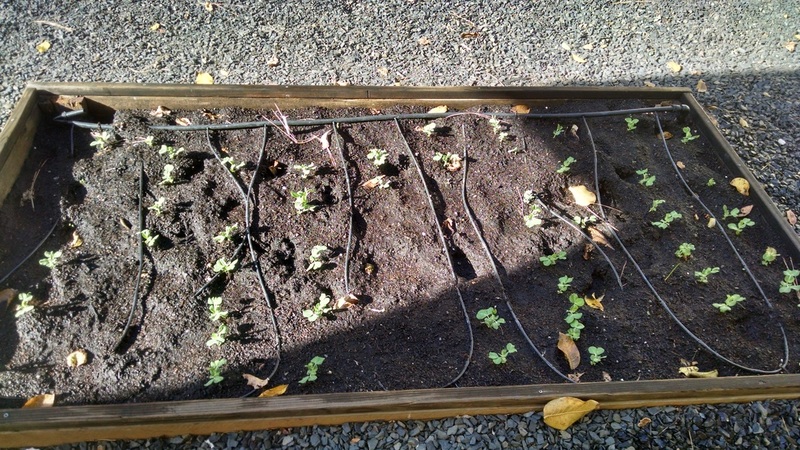 During our last weeks of sunny weather in November, the 6th graders planted a winter garden. They filled some old garden beds with soil donated to us by our community partner, the Earthworm Soil Factory on Neal Rd., and planted winter vegetable starts and seeds three of the garden beds. 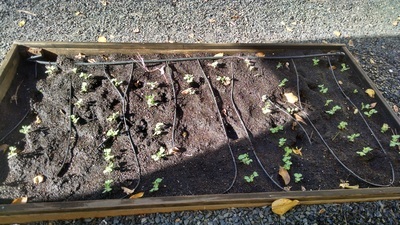 Veggies planted our prototype planter box for our upgrade included two types of broccoli-- Romanesco and another type, celery, and Brussels sprouts. Thanks to a generous donation of organic seeds from Peaceful Valley Farm Supply in Grass Valley, we also had many seeds from which to choose. We elected to plant seeds of Red Russian kale, White Icicle radishes, French breakfast radishes, and Lunar white carrots and several types of lettuce along with starts of Napa cabbage in the adjacent box. Finally, we planted snow peas in a shady bed near the building from seeds we checked out from our newly established Seed Lending Library at the Paradise Public Library. What a great resource for our school gardens and our town! 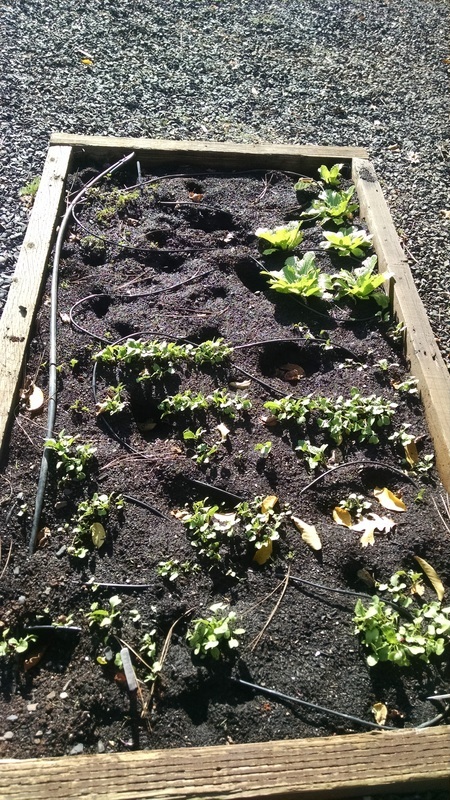 This blog is maintained by our volunteer garden coordinators and the 6th grade students.